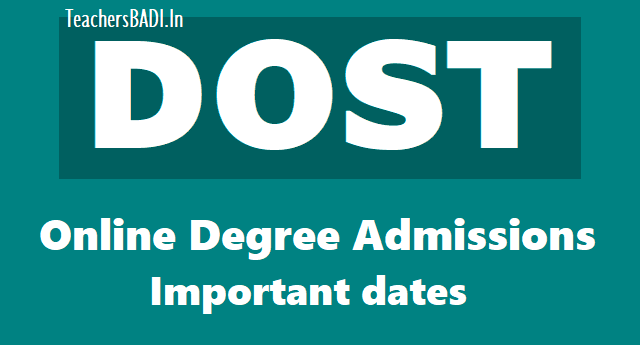 Telangana DOST Degree admissions 2018 / DOST Online Degree Admissions: The schedule for the Degree Online Services, Telangana (DOST) admissions 2018 has been released on the official portal : dost.cgg.gov.in. The Telangana State Board of Intermediate Education (TSBIE) has announced the result for intermediate 1st and 2nd year examination and all those students who have cleared the 2nd year exams will now be going for the degree admission, through DOST. In order to obtain admission in degree programmes in universities in Telangan, they will be required to get themselves registered on the DOST portal. As per the released schedule, the official notification regarding the same will be releases on May 8 and the registration for the same will commence from May 10. Candidates who had successfully registered for Telangana DOST 2018, must keep a tab on the official website for the 3rd Allotment List and follow the further counseling process by reporting to allocated colleges from 2 to 4 July 2018. Telangana DOST 3rd Allotment List is scheduled to be released tomorrow i.e. 30 June 2018 by the Telangana State Council of Higher Education (TSCHE) on its official website – dost.cgg.gov.in. TSCHE had started registration for Degree Online Services of Telangana (DOST) last month for candidates seeking admissions to Undergraduate courses like B.A./B.Sc./B.Com./B.Com.(Voc)/B.Com. (Hons)/BSW/BBA /BBM/BCA etc at colleges and institutions affiliated with Telangana State’s 6 universities viz Mahatma Gandhi University, Palamuru University, Satavahana University, Telangana University, Kakatiya University, and Osmania University for the academic session of 2018-19. Candidates who had successfully registered for Telangana DOST 2018, must keep a tab on the official website for the 3rd Allotment List and follow the further counseling process by reporting to allocated colleges from 2 to 4 July 2018. The Class Work-I Semester will begin on 2 July 2018 while the Intra college phase will be held from 5 to 7 July. The first list of seat allotment was released on 4 June 2018 and candidates were asked to report at the respective colleges from 5 to 12 June 2018; while the second list of seat allotment was released on 19 June 2018.
for the academic session of 2018-2019.
under one umbrella giving the students a wide range of colleges and courses to choose. Last year, Aadhaar card details were being matched with the biometric details of all the candidates to avoid duplication or fake admissions cases. The Telangana State Council of Higher Education (TSCHE) will be releasing the Degree Online Services of Telangana (DOST) third allotment list tomorrow, on June 30, as per the official website. The registration process for the DOST admissions 2018 began on Thursday, May 10. Once releases, all those who had applied for admission can check the list at— dost.cgg.gov.in. After seat allotment, students will be able to get admission in undergraduate courses at various colleges affiliated with Osmania University, Kakatiya University, Telangana University, Mahatma Gandhi University, Satavahana University and Palamuru University for the academic session of 2018-19. The Telangana State Board of Intermediate Education (TSBIE) announced the result for intermediate 1st and 2nd year examination few weeks back and all those who had cleared the 2nd year exams will now be going for the degree admission, through DOST. The results were released by Deputy CM and Education Minister Kadiyam Srihari. The second year exams were held from March 1 to March 19 at around 1,294 centres. Last year, Aadhaar card details were being matched with the biometric details of all the candidates to avoid duplication or fake admissions cases.A total of 4,29,398 students gave the exam. The girls have outshone boys with a pass percentage of 73.2 per cent and boys are at 61 per cent.Similarly, for the second year intermediate students, the pass percentage is at 67.25 per cent. The first year exams were conducted from February 28 to March 17, while the second year exams were held from March 1 to March 19 at around 1,294 centres. This year, a total of 4.55 lakh students from the first year appeared for the inter exams of which 62.35 per cent have passed. Similarly, for the second year intermediate students, the pass percentage is at 67.25 per cent. A total of 4.30 lakh students gave the exam. The Intermediate Advanced Supplementary Examinations will be held from May 14 and practical examinations from May 24 to 28. The ethics and human values paper will be held on May 29 and environmental education exam on May 30.